Let’s start with some upcoming events we haven’t mentioned yet. A number of Los Angeles-area legislative districts are holding special elections on Tuesday; Bike the Vote LA has rated the candidates in each district. Westside bike co-op Bikerowave is hosting a ride to the hapa.me exhibit in Little Tokyo on April 7th. 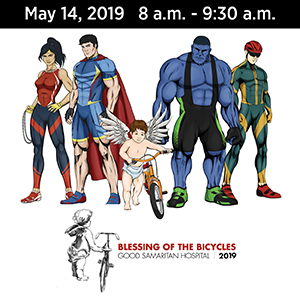 LACBC is hosting a short ride 5-mile ride to discover the bike paths of Santa Clarita on April 7th, in conjunction with Metro, the Santa Clarita Valley Bicycle Coalition and the City of Santa Clarita! Registration opens April 8th for Phil Gaimon’s Phil’s Cookie Fondo. 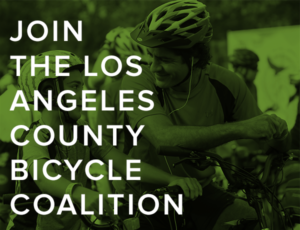 LACBC teams with Bike SGV to host their monthly Sunday Funday ride through the San Gabriel Valley on April 8th. Culver City goes to the polls on April 10th; Bike the Vote LA offers their guide to the bike-friendly candidates. Bike SGV is hosting a ride on the Eaton Wash on April 29th as part of their series to explore greenways in the San Gabriel Valley. We missed this report earlier this week, as a 65-year old woman was killed in a collision as she was walking her bike across a Fontana Street Tuesday morning. And then some lowlife scum stole her bicycle before police could collect it as evidence. Let’s hope it was just a mistake, and someone took the bike to hold it until it could be picked up. This one really pisses me off. Police in bike-unfriendly San Leandro are allegedly confiscating kids’ bicycles for traffic infractions, under the pretext that they might be stolen. And reportedly dooring teenage bike riders on purpose, and holding unarmed children at gunpoint. To the best of my knowledge, there is nothing in the law that allows police to confiscate bicycles based on nothing more than a supposition. Which is no different than impounding a driver’s car simply because he looks suspicious, with nothing to back it up. Meanwhile, intentionally dooring a bike rider not only violates the vehicle code, it’s assault with a deadly weapon and an illegal use of force. And don’t even get me started on pulling a weapon on nonviolent children for the crime of simply riding a bicycle. Let’s hope this story results in a fleet of lawyers descending on the town. And whoever is responsible for these outrageous policies finding new work as an unarmed security guard at the local mall. Long Beach Bike Ambassador Tony Cruz offers basic advice on how to ride a bike safely. Although there could have been a mention of road position beside merely riding outside the door zone. Los Angeles will make safety improvements to six major streets next year. Of the six, only Avalon Blvd in South LA will get protected bike lanes, while a gap will be closed in the bike lanes on Reseda Blvd. LADOT wants your input to improve their websites; you’ll be entered in a drawing for a $50 Amazon gift card if you complete the 15-minute survey. 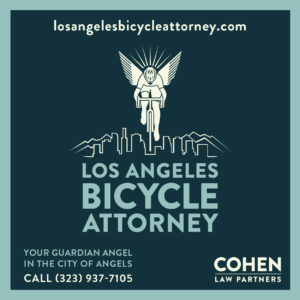 Bike SGV wants to profile people who ride their bikes in the San Gabriel Valley. CiclaValley questions whether wind gusts are scarier than blowouts on a descent, after getting caught in one himself. LimeBike’s San Diego general manager swears they haven’t deployed their lime green dockless bikeshare bikes in Ocean Beach yet, even if observers swear otherwise. Meanwhile, Coronado carts off the dockless bikes that have besmirched their fair city. Point Loma residents reach an agreement to halt the repeated demolition of a DIY pump track by promising to keep their kids off it until the situation can be resolved. Evidently, traffic safety denying is contagious, as Keep LA Moving’s anti-safety message has spread to Oakland. Streetsblog talks with the interim director of Bike East Bay, as the Bay Area advocacy group prepares to launch a search for a new executive director. Ebikes really are pulling people out of their cars; 28% of people surveyed purchased their ebikes to reduce their reliance on cars, while 76% of ebike trips would have otherwise been made by car. Canadian musician Rich Aucion is on a 15-city tour of the US, riding from gig to gig by bike in what will eventually be a coast-to-coast ride to raise funds for a mental health organization. A Utah mountain bike expert offers advice on trail etiquette. A tech startup is working with Trek to reduce bicycle collisions using artificial intelligence. Philadelphia’s bike-hating columnist inexplicably says flipping bike lanes from the right to the left side on two one way streets is equivalent to flipping the bird to local residents. And compares the city’s bike advocacy group to the NRA. A New Orleans suburb installs a temporary, popup separated bike lane to test acceptance before making a commitment. Streetsblog visits the bikeways and ciclovía of Lima, Peru. A new paper from a Canadian university considers how news coverage of fatal collisions dehumanizes victims and absolves drivers. 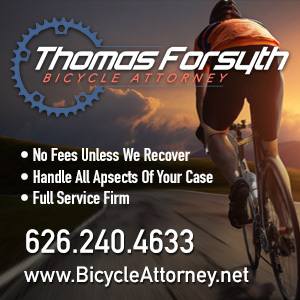 Bicycling injuries increased 90% in England’s Richmondshire district following the country’s 2014 Tour de France start, due to an increase in ridership on the country roads made famous by the race. This one bears repeating in case you missed it yesterday. An Italian study shows that making hi-viz mandatory for cyclists does nothing to improve safety. A disabled polio survivor from Nepal visits Brunei, the 68th country he’s visited on his round-the-world bike tour. Yet another reminder that bikes offer increased mobility for people with disabilities. Running over an Australian bicyclist was nothing more than a “bump in the road” for one truck driver. Women’s bike racing comes to Ontario this Sunday. A local community paper looks forward to May’s Redlands Bicycle Classic. A look at five great Malaysian cycling champs. And one really bad mustache. The war on bikes continues, as a Columbian pro cyclist was attacked by a road raging driver while training in Italy after complaining about an dangerously close pass. When you’re ranked dead last, anything is an improvement. Your old bike tires could be haute couture. And if you’re caught on video trying to steal a bike, come up with a better excuse than alleging that the owner asked you to bust the lock and bring it to him. Thanks to Elizabeth T for her generous donation to the unofficial BikinginLA Dead Computer Replacement Fund, which has now reached an unofficial $300. Best wishes to all for a very happy Easter weekend and Passover. Let’s all mark this weekend by taking a moment to share a little kindness with someone in need.